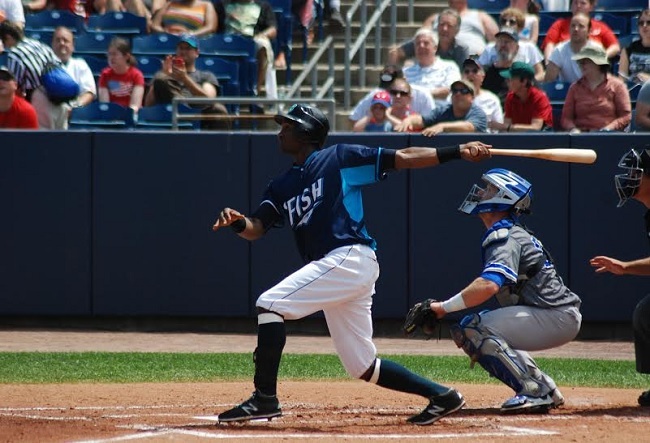 Bridgeport Bluefish outfielder Welington Dotel was named the Atlantic League Player of the Year, the league announced Wednesday. Dotel was unanimously chosen for this award by a panel of voters. Dotel led the Atlantic League in hits (180), triples (13), extra base hits (52), total bases (261), stolen bases (45), and slugging percentage (.492), ranked second in batting average (.340), third in doubles (31), and fifth in games played (133) and on-base percentage (.371). He also collected eight home runs, 68 RBI, and 68 runs scored. Welington now holds Bluefish single season records in hits and triples, and a career mark in batting average (minimum 500 at-bats). The slugger was previously named to the 2015 Atlantic League All-Star Team earlier this year and won the All-Star Game Home Run Derby. For the full story, visit www.ctpost.com.